The disappearance of a Boston-area teenager shocks three close-knit communities. I know Caleb Jacoby as a quiet and restrained kid. Maybe slightly sullen in that teenagerish way, but a good boy. For a 16 year old, he is unusually tall and stoic and smart. He spends a lot of time reading, which was the way I was when I went to Maimonides, the Jewish day school where both Caleb and my youngest brother, Austin, are in 11th grade. The missing persons poster currently circulating on Facebook and Twitter notes Caleb’s fondness for public libraries, but they’ve been checked and he’s not there. He’s also not at Young Israel of Brookline, Massachusetts, the other hangout mentioned on that poster, but they did have a prayer vigil for him there Tuesday night. On Monday afternoon around 12:30, Caleb left his Brookline home, ostensibly for Maimonides about a mile away. He has not been seen or heard from since. Early on Monday night, Austin posted a status on Facebook: “hey. everyone. Caleb has not been at school today and he did not come home for dinner. His parents are getting concerned.” Seeing the post at the time, I thought maybe my little brother was being dramatic, but by Tuesday afternoon, when pictures of Caleb started cropping up in my Twitter feed with the word “missing” attached, no one could mistake the situation for anything but serious. In the world of social media, the “Missing Person” story is kind of strange animal. It’s deeply, deeply personal, but it also forces families to publicize their crisis and seek help from every quarter possible. “You need community,” says Todd Matthews, who works for the National Institute of Justice’s National Missing and Unidentified Persons System. “Community can be anything, and they can be scattered all over the world. They’re any group of motivated people that are looking for someone who has seen something.” This past weekend, for instance, an AP photographer took a picture of a young homeless man trying to warm himself on a grate in Washington, D.C. As it turned out, the man was 20-year-old Nick Simmons of Greece, New York, who hadn’t been heard from since he drove away from home on New Year’s Day without his wallet or cell phone. The family found out about the picture via a Facebook page they’d had set up and used Twitter to contact the reporter who’d written the story where the photo appeared. Caleb’s parents are, no doubt, hoping for a similar outcome. News of their son’s disappearance has exploded on Twitter and Facebook and generated an uncommon amount of concern and support. The local community has formed search parties, circulated flyers, and turned the lobby of Maimonides into a veritable “Find Caleb” command center. But Caleb’s story has also captivated two wider communities. Caleb’s father, Jeff Jacoby, is a conservative columnist for The Boston Globe, and his crisis has drawn sympathy from other conservative journalists. And because Maimonides is a major pillar of Modern Orthodox learning, the wider Jewish community has also picked up the story. Caleb’s disappearance has been reported by every significant Jewish paper and website. Orthodox Jews have been tweeting Caleb’s Hebrew name (“Calev Avraham ben Elisheva”) so people can pray for him as they recite their psalms in prayer for his safe return. Judging from responses on Twitter, more than a few people have. Police have told Maimonides parents that they’ve never seen this degree of interest in a missing person. They’ve received calls from strangers in Israel who are ready to fly over and carefully comb the streets of Brookline with the Maimonides classmates who are searching for him, house-to-house, in below-freezing weather. For Modern Orthodox Jews, the story has radically altered and personalized the notion of missing children. And for Caleb’s neighbors, the “it-couldn’t-happen-here-ness” that is practically synonymous with Brookline’s suburban idyll has been totally shattered. Once a year, when Caleb was younger, his father would take a break from writing about hot-button political issues like pension reform or Roe v. Wade, and turn his column into a letter to his son, writing frankly and intelligently about the challenges of fatherhood. In one of those columns, written on the occasion of Caleb’s 10th birthday, he recalled a lesson from Rabbi Joseph Telushkin, who wrote that rather than feeling “startled or inconvenienced by the siren of an ambulance or firetruck,” we should “offer a prayer that the EMTs or firefighters arrive in time to help whoever is in danger.” I’m hopeful that help will arrive for Caleb. And the next time a missing person announcement appears on my Twitter feed, I’ll read it carefully and retweet it before it’s whisked away, downstream. Our prayers have been answered. 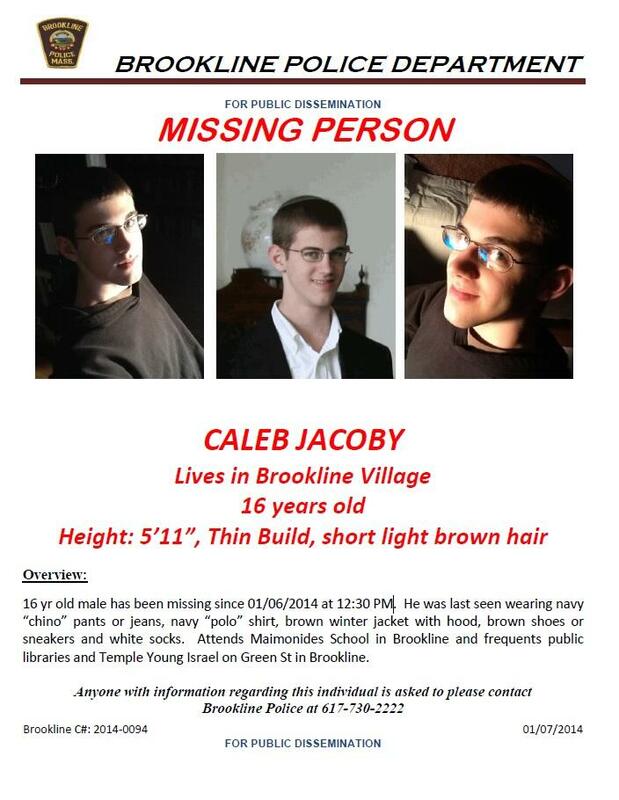 We are thrilled to hear from the Brookline Police that our beloved son Caleb has been found and is safe. Alex Edelman is a comedian and writer based in New York.